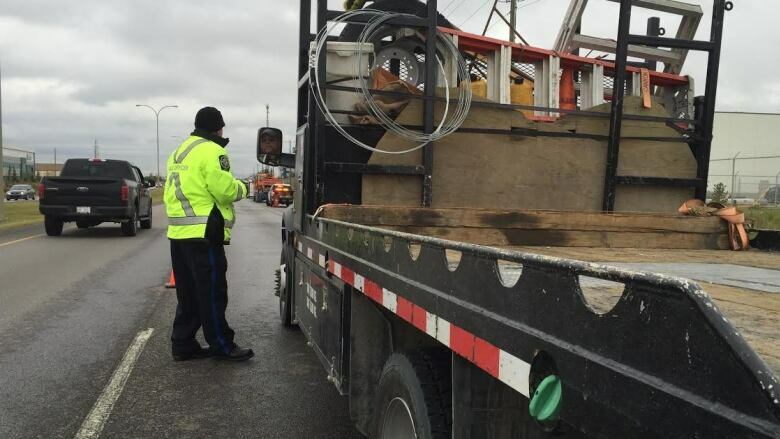 Calgary police say the number of commercial trucks that fail roadside inspections has nearly doubled in the past couple of years. Police are in the midst of conducting an inter-agency three-day vehicle inspection at locations around the city. Const. Chris Moriarity, who oversees these inspections, says the numbers are concerning. "Oh, absolutely there's danger, I mean if the cargo's insecure, if the trucks are not fit to be on the road, if they get involved in a large crash, it could be catastrophic," he said. In the past couple of years, Moriarity says the number of vehicles that fail has doubled from about 30 to 60 per cent, as drivers scramble to make money in a worsening recession. "If they don't have the money to put into the truck, that's the last thing they're going to put money into is the repairs, because the only way they make money is if they have that truck on the road." Calgary police operate weekly commercial vehicle inspections through the year, with more thorough ones conducted in the fall and spring.